Blackburn Rovers vs Newcastle United – What the managers are saying. | NUFC Blog. 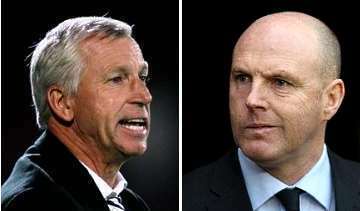 Blackburn Rovers vs Newcastle United – What the managers are saying. Hello and welcome to our review of what the managers have been saying in the run up to Newcastle United’s League Cup game with Blackburn Rovers, which kicks off at 8PM this evening at Ewood Park. For an in depth preview of the match, please check out our match preview, in which I take a look at the team news, previous stats between the sides, squads, possible selction and tactics etc. We will also be running our usual “match banter” feature during the game, which will go out around an hour before the kick off. “You can only strive for them if you’ve got success in the Premier League, because the stability of the football club depends on the stability in the Premier League. “I know Steve Kean, I’ve worked with Steve Kean, and this is a good professional person in terms of being in charge of a football club,” he said. “He’s got good experience. “He’s having a tough time with the home fans and that makes it tough for the team, so it’s a tough agenda for them. But it’s not something that they can’t come through. “As Mick McCarthy proved with Wolves at the weekend, sometimes just one little thing can change the whole dynamics of something. I expect Wolves and Mick to kick on from that and that’s what Steve Kean will be looking for; just something to grab hold of and to kick on from. “I think it’s very important that they get a result so I think they’ll be very strong. It’s a cup-tie and at the level we’re playing at, there’s going to be nothing between us so it’s about desire and, on the night, making sure you do your job to the best of your ability – and hopefully win the game. “We’ve a little bit of choice, but our programme is tighter than Newcastle’s as we played Sunday, they played Saturday, after this we play Saturday and they don’t play until Monday night, so we’ve been a lot lighter on them so far in terms of the pre-match preparation. Well Pardew is probably right to say that despite everything, this will still be a tough away game in which anything could happen, especially if it goes to penalties in the end. Writing personally, I only hope that he is brave and puts out a strong side this evening. It was only in 2002 that Blackburn won this trophy, however Newcastle have never won it, and it has now been over forty years since we won any major trophy. As we are in a strong position, and winning this could give us a place in Europe whether we finish the season on the top places or not, I feel that it would be well worth going for. Gotta be a first for Pardew, finding something he did’nt wanna talk about! With the possibility of both Saylor and Tiote unavailable, guess we are going to finally see changes. Hope that includes both HBA and Marveaux, doncha think it’s also about time Santon got a start ? Posted my choice of sides on the other blog, which included Santon a LB, with Cabaye taking on the Tiote role. Both Marv and Abeid on the right side and HBA and Ferguson on the left flank. And Perch filling in for Saylor, yeah i know he’s not liked by most, I just think he’s a decent and versatile little player. “we have a strong squad” then how about using them ? Does the excuse of injuries, now allow changes ? He’s asked to do interviews, it’s part of the job. It’s not like he’s getting out his soap box, placing it in front of SJP and just going off. Honestly, might’ve been funny the first time, but let it go. Hard game this one. In the past, United have gone into games against teams who are struggling – and failed to do the business. Tiote and Taylor will be a big miss – but on the other hand, this is probably the sternest test yet of the depth (or not!) of the current squad – and Pardew’s (Carver’s?) ability to motivate them. CanadaTOON Perhaps you’d care to point out where it says anything like that in this piece? Did you actually bother to read it before jumping the gun? I’m definitely looking forward to the team sheet for this onr more than usual UTD111. I’ve just noticed its a rather significant theme in your writing. Originality never hurt you know. Plenty of experience, and plenty of pace! Can’t wait! Shoot the goals mighty newcastle! No Paul Dalglish or Frank Pingel upfront then boater? Stop picking on Pardew and a little more originality if you please, oh! whoops sorry, that was me. Actually i’m calling for a little more originality from Pardew, have a feeling it’s gonna be a long wait ! Reading the rumor about a possible move for Brown @ Celtic. He is apparently on the last year of his contract and looks disinterested in an extension. Four million could get us a Tiote clone, which we need badly. Guy can run all day and put his foot in, ideal for using in tandem with Tiote for games against, the Wolves, Stoke type sides, or platooned with Tiote. Someone in the EPL will sign him, as tough tackling DM’s are at a premium. Worky – no room with hottiger, serrant, glass, bracewell, Varadi etc. Good team out there the neet. HWTL!